Steph's Brain Farts: Hibernation is Still Over - Full Speed Ahead! Hibernation is Still Over - Full Speed Ahead! Hey everyone! It's been a really long time since I've been active on here, or really on any of my social accounts, so thank you for your patience and all of the kind messages I've had waiting for me! So where have I been all this time? Well, the reality of being an independent adult has set in over the last year, complicated by the fact that I've decided to make my living as an independent artist... I guess what I am saying is "Hooo boy, am I in debt from a crappy year of freelancing!" While it gave me enough spare time to get Snorffles & Meeps 3 done, it's taken its toll on my savings account, and I've had to really focus on getting some solid, paid work. No easy feat in this economy, and with the entertainment industry being what it is right now, it's been very stressful and uncertain. Luckily, I've had a whole new world opened up to me by signing with The Bright Agency this past January. I currently have 3 picture books in the works with major publishers (one of which is a series you all grew up with! EEEEE!) and I am being kept very busy with smaller book titles and hopefully children's licensing. It's ended up being a real challenge but also much more fun and freeing than my work in the gaming industry has been in all of 7 years, so I am very grateful to be in this position right now. On top of this, I am still doing vis dev work for animation and toy design, so I get to keep my favorite bits and pieces of the design world. Things are starting to look up! It does mean that there is less time for personal artwork, and really even getting a single new piece done for Emerald City Comic Con has been nearly impossible and it may not even happen. But the overlap of my professional work and personal work had blurred significantly, so I am feeling satisfied with what I am doing these days - the bummer is that I can't talk about it or show anything for at least a year. Boo! 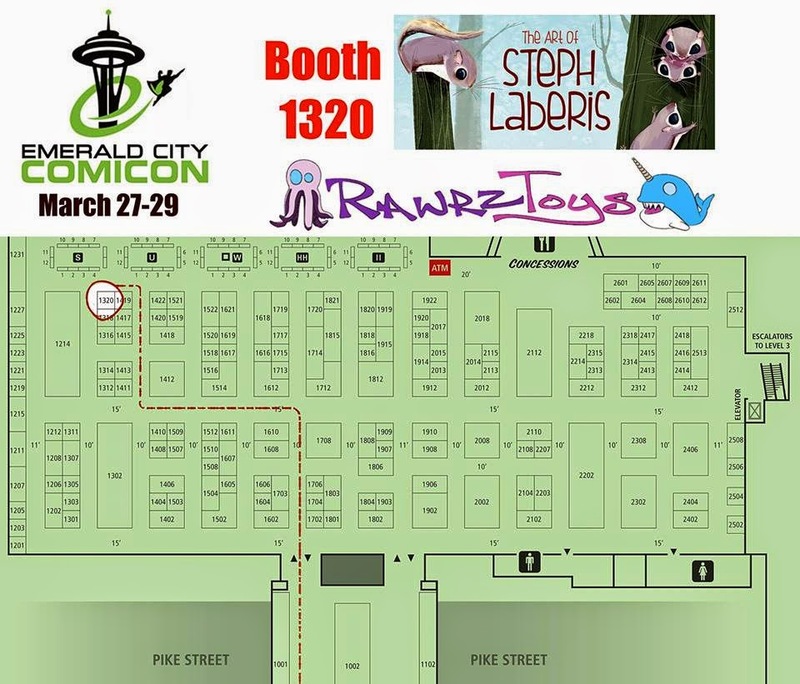 Speaking of ECCC, this is where I will be! 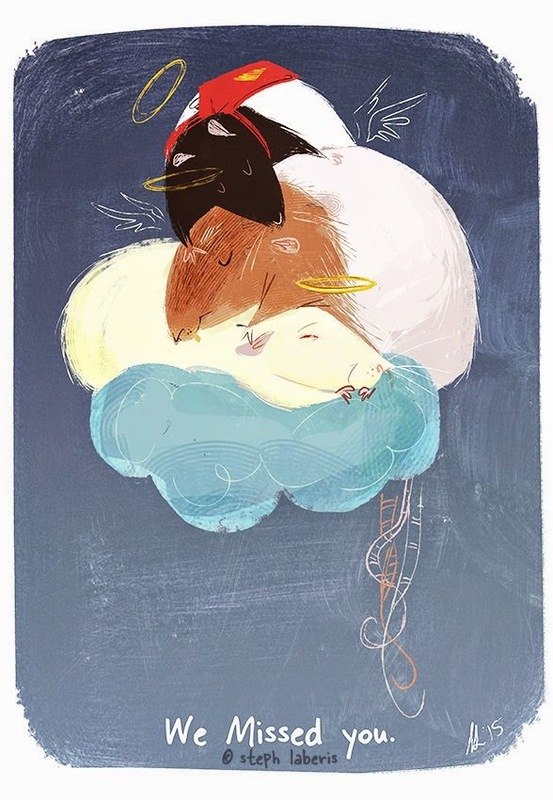 I will be selling the last copies for Snorffles & Meeps! Vol. 3, tons of prints, greeting cards and hopefully that new piece! On the rodent front, it's been a tough year already. I lost Al to the ripe old age of 3 and his companion, Doodle, to cancer. I haven't been able to do a piece for Doodle just yet, but here is one of Al reuniting with his 2 beloved partners in rattie crime. Finally, I will be posting a breakdown on working with agencies and how to go about finding one. Seems a lot of my friends and colleagues are considering this route, so I hope people will find my experience helpful. Hang tight! Thank you for giving posts and articles were very amazing. I really liked as a part of the article. With a nice and interesting topics. Has helped a lot of people who do not challenge things people should know. You need more publicize this because many people. Who know about it very few people know this. Success for you....!!! Buy Stuff from My Shop! Link Me on Linked In!